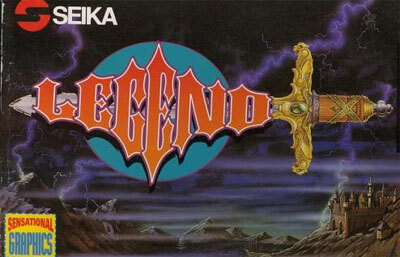 Legend is a side-scrolling Beat' em Up set in a fantasy world. You have to rid the kingdom of Sellech of the king's evil son Clovius, who wants to conquer the kingdom by harnessing the power of the imprisoned soul of Beldor, who once ruled over Sellech as a despot. To complete your quest, you must fight your way through numerous enemies using different combinations of slashes and kicks. You cannot perform any throws, but there are different magic attacks and a special attack. The special attack is a ranged attack that consumes a certain amount of energy, whereas the different spells use up magic bags that can be found throughout the game and damage every enemy on screen. Defeated enemies drop different kinds of items such as magic bags , food to replenish your health, money and keys that are used to open treasure chests in some of the bonus-games that take place in-between battles. Naturally, at the end of each stage, a powerful boss is waiting to be defeated.